CONCUSSION is a compelling David Vs. Goliath story, it’s a true great American story, and it’s Will Smith’s best performance since 2006’s “The Pursuit Of Happiness” Written and directed by Peter Landesman, based on the GQ article “Game Brain,” you’ve all seen the trailer for CONCUSSION which has Will Smith playing real life accomplished forensic neuropathologist, Dr. Bennet Omalu, who discovered a disease called Chronic Traumatic Encephalopathy (CTE) which a progressive degenerative disease found in people with a history of repetitive brain trauma, and it’s commonly found nowadays in pro-football player because they get repeated bows to the head every time they play, this is a heavy contact sport, as we all know. Will Smith’s performance in this film really burns with convictions, he will have you take his side in a heartbeat. There’s a bit of “A Few Good Men” ‘tell me the truth you can’t handle the truth’ sorta moment mixed with Denzel Washington’s ‘love’s gonna bust me out’ moment in “Hurricane” so it’s clear that over the years, Will has learned from his fellow masters and honed his skills or his artistry to perfection. Somebody told me once that Will is a big fan of the Philadelphia Eagles team, so it’s interesting to see him play the role of a man who takes on the NFL. So the film is about this immigrant doctor with high ethical standards and he truly loves America and yet the America he loves seems to be trying to shut him up because he’s basically going up against the sport Americans live and breath for and one of the biggest most capitalistic organizations in the country. When you’re messing with a giant business because you’ve discovered a truth about them that they don’t like or a truth that might hurt their profit-making, you’re bound to get bullied by the giant.The film itself is set in a way that makes you feel like you’re going on an uphill battle. I think writer/director Peter Landesman approached it in a way that doesn’t demonize American football, but sheds a light on the truth about it, just like what the real Dr. Omalu did. 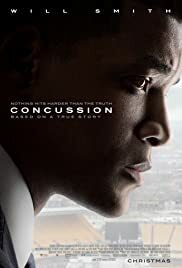 It is also a story about immigrants, a fact which sadly a lot of Americans today seem to forget, that we are a nation of immigrants.CONCUSSION will surely give rise to discussions not just among NFL players and team owners but also among audiences and football fans. But will the discussion only last a dinner table’s length and then be forgotten once Sunday game comes around again? I read up after watching the movie and found that the NFL still makes excuses in admitting the impact CTE has on their players. They’ve done settlements, they’ve paid millions of dollars to families, they’ve changed some things about the way the game is played but keep in mind that this is a big money-making business, so when money is at stake, unfortunately human lives get negotiated over.